We’re hard at work with our MacVector 12 which will be out toward the end of the year. This is a little longer than our usual six months since MacVector 11.1 came out. However, this is a big release! There has been a rewrite of various interfaces with the aim of making them more accessible to new users and for making cloning and constructs easier. It is also focused on increasing the performance of all graphical aspects of the interface. For example the map view has been completely redesigned and rewritten. Graphical overviews are the easiest way to visualise your sequence and in MacVector 12 even very large sequences with a rich level of annotation can be visualised and navigated easily. MacVector is a great tool for designing and documenting cloning strategies and this release has many improvements to make it even better. Restriction mapping enzymes that cut only at a single site are represented in a different colour to enzymes that cut at multiple sites, so making choosing suitable enzymes much easier. Once you have digested a fragment the active window will highlight compatible sites in the vector sequence. So at a glance you can see where you can ligate your insert (see screenshot below). Need to introduce a new restriction site into your vector with site directed mutagenesis or other techniques? With MacVector 12 you will also be able to visualise “one out” restriction sites – These are potential restriction sites on the sequence where a single mutation will introduce a new restriction enzyme recognition site. Visualising a graphical map or overview of your gene is far easier than sending your eyes dizzy with megabases of raw sequence. However, there are times when you just need to get down to the sequence. With MacVector 12 you can do both in the same window! With the “Zoom to Residue” feature you can show the graphical map at sequence level. You may now show the complementary strand and also show 3/6 frame translations of the sequence. CDS features are displayed as the translated amino acid sequence when at residue level, rather than the graphic symbol used to represent them. Primer features are represented as residues at residue level too. The exact cut site of restriction enzymes will be shown indicating overhanging and blunt ends. Navigating around a sequence in general is simpler, especially for plasmids or other circular sequences. You can use arrow keys to nudge/slide through a selected segment (and have any results update appropriately). There is also a new Overview panel. This tool shows an overview of the entire sequence and allows you to drag a viewing box to show what region to show in the main Map window. The overview will only show the sequence in its true topology. This means that even if you are representing a plasmid as a linear sequence, for example to zoom into the multiple cloning site of a vector for ligating a fragment, then the overview tool will always show a circular sequence, with the location of the main window indicated. Selecting across circular origins has been a long standing limitation in MacVector. In previous versions only a few algorithms worked across the ends of a circular sequence and you could not select across the origin of a circular molecule. With MacVector 12 you can select across the ends, so you can design primers across the ends, replace a segment there, or easily create features that span the split point. Although MacVector supports the creation of 100% Genbank compatible features on your sequence, sometimes you just need to highlight a particular section of the sequence you are working on. MacVector 12 now supports representing regions of the sequence in upper and lower case, and also to represent regions with coloured text. This allows easy one click annotation, or marking, of non-biological features. As usual there are a large number of minor improvements, as well as a whole stack of bug fixes. These include support for a new auto-single static license for large Network sites. In our ongoing aim to make MacVector the easiest to use application for sequence analysis many tool dialogs have been rewritten to be easier to use. The Symbol Editor has been rewritten. The Graphics Palette has been completely redesigned to make it far easier to manipulate the map view to show your sequence how you want to see it.The Symbol editor has been redesigned to be easier to use and now has new symbol types – e.g. Full height rectangles, plain horizontal lines, plain lines with short vertical ends, single arrows with no drop to the sequence. The Generate Transcript. 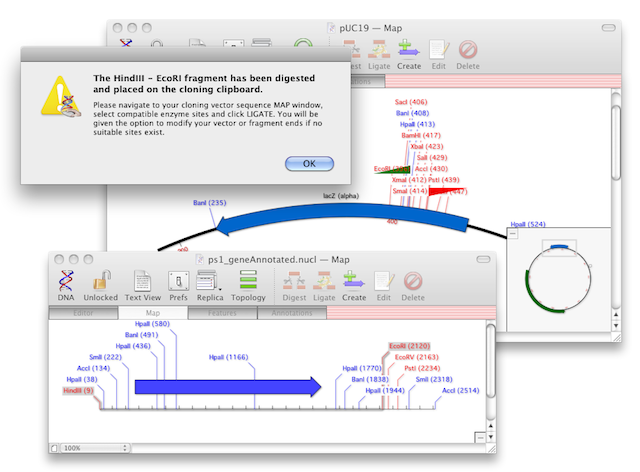 dialog has been rewritten to make creating an RNA transcript from your sequence easier and much more. There has also been continued work on the various graphic result windows to integrate them with the main Map tab. That will make it easier to convert results (e.g. 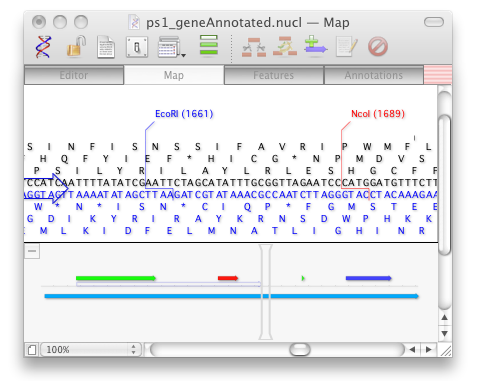 open reading frames from the Nucleic Acid Toolbox) into features associated with a sequence. Watch our blog for updates, and also subscribe to our RSS feed for the latest news. MacVector 12 will be released towards the end of 2010.